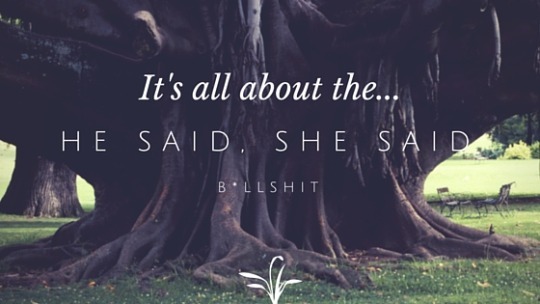 It’s All About The He Said, She Said…. “Do you think we should fight?” she said. "HELP ME! !“ he said. Today I’d like to discuss the word "said.” The more modern novels I read, the more I hate this speech tag. It sounds silly on the surface to hate such an innocuous word, such a blatantly necessary word by any and all novels eventually. But when I have to be told on nearly every line of dialogue that he said this, she said that, he said that and she said this, it gets annoying really fast. But annoying is one thing, being pulled out of the story is another. And when characters are in absolute dire, life and death situations just say things rather than shout them, it actually pulls me out of the story. Even good stories. No author wants that. There is a school of thought that chastises both new and well-established authors alike when a tag like “shouted” or “exclaimed” is used to describe an outburst from their characters. Likewise, authors are also encouraged to use “said” when someone asks a question. These methods seem absolutely ridiculous to me, and I really hope publishing houses aren’t forcing authors to live by them, but I suspect they may be. Is this good advice? Should all writers adhere to this? Coming from a man who arguably held more mastery of dialogue than most writers of our time—according to many bestselling authors, anyway—is probably advice we should listen to. But is there another way? A better way? Not telling us who said what at all? Mr. Leonard even advocated not sticking our noses into our characters’ business, didn’t he? I present three examples to show—not tell, mind you, that’s a whole ‘nother blog post—a character in a random situation. A. The princess reeled at the stench of decay that burst forth from the dragon’s gaping maw. "Take cover!” she screamed to her companions. She leaped from the cliff and drove her broadsword deep into the beast’s eye. B. The princess reeled at the stench of decay that burst forth from the dragon’s gaping maw. "Take cover!“ she said to her companions. She leaped from the cliff and drove her broadsword deep into the beast’s eye. C. The princess reeled at the stench of decay that burst forth from the dragon’s gaping maw. Her head snapped toward her companions. "Take cover!” She leaped from the cliff and drove her broadsword deep into the beast’s eye. Three sentences, all portraying the same scene, the only difference is the text in bold. First, let’s examine example A., the one thing Mr. Leonard said never to do. It seems much more realistic to the situation, as the princess-turned-warrior would surely be shouting at the top of her lungs in a situation like this. After all, blockbuster films have taught us dragons are noisy beasts, especially in the heat of combat. "Said"—as illustrated in Example B.—just doesn’t seem to cut it in such a scene. It takes away from the intense action if you ask me. I see nothing wrong with this option, and here I’m sure someone would roll over in his grave to hear me say such a thing. But there’s yet another way: Example C.
In Example C, all versions of “said” are eliminated. This is called utilizing “action tags.” We all know it’s the princess who is talking (or screaming or shouting) to her friends to get to a safe place should her next attack go terribly awry; we don’t need to be told. We know this because the “tag” just before the dialogue focused us on her. So why explain she is the one spouting the dialogue at all? I enjoy using action tags and have been complimented by contest judges for doing so. They allow a much more interesting interaction between author and reader than simply explaining, “he said, she said, she said, he said” every other line. The trick to doing this successfully is to read through your dialogue several times and triple-check that there’s zero question as to who is speaking. A best practice would be to let several people read it and see if any of them find confusion. Now, all that said, here’s the last word. For Hemingway’s sake, readers are smart people. Writers, you don’t have to hand-feed us every instance anyone utters a single word. If it’s that confusing who’s talking, your dialogue probably needs a *lot* of work. Here’s a writer’s exercise for you: Step One: when you’re done with your next Great American Novel, go back and do a search for the number of times “said” appears in your manuscript. Step Two: DELETE HALF OF THEM. You might do one more run-through and cut down on a good chunk of your action and descriptive tags, too. Your readers will thank you. Trust me.